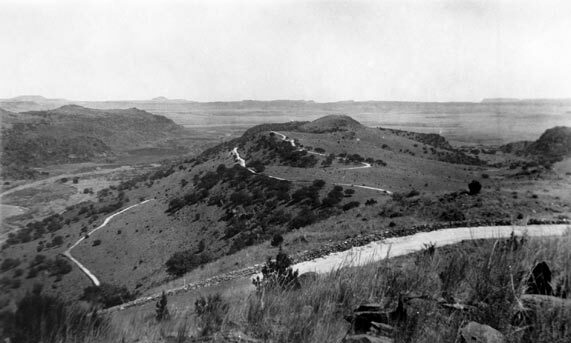 Skyline Drive traverses the face and top of the ridge separating the park from the town of Fort Davis. CCC enrollees built the road with basic tools-hand rock drills, pickaxes, shovels, and wheelbarrows. The dry-laid guardrails were constructed of locally excavated and hand-shaped stone; unfortunately, they no longer exist. This view looks down the streambed of Limpia Creek.